Ready to transform the joint replacement experience for your patients? 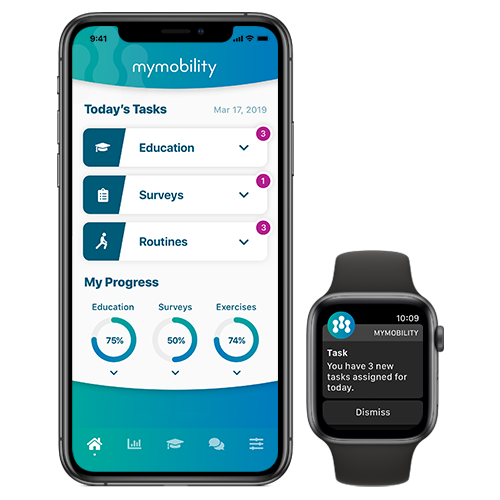 mymobility™ with Apple Watch® is a care management system designed to help you and your care team deliver exceptional orthopaedic procedure experiences to qualified patients. *Delivering the capability to monitor patient engagement, PROMs, activity level and compliance, mymobility utilizes iPhone and Apple Watch to track patient steps, standing hours, flights climbed, active calories, exercise minutes, heart rate, resting heart rate, walking heart rate average and heart rate variability. This data is intended to inform and improve pre-surgery evaluations with information on the patient’s heart rate and activity level. It can inform surgical decisions, such as anesthetic selection, and will provide continuous data postoperatively to monitor recovery progress, while providing quantitative outcome measurements. Surgical preparation and recovery are managed efficiently and consistently through the use of the mymobility app, designed to improve patient education and communication pre- and postoperatively. At the same time, your care team workflow is strengthened with remote monitoring and utilization of a clinician dashboard. The mymobility app and Apple Watch work together to keep patients engaged in their orthopaedic procedure preparation and recovery. Providing educational information pre- and postoperatively helps patients be better prepared and able to take an active role in their recovery process. The system collects and reports patient data on activity levels, PROMs, engagement and compliance so you can see how the patient is doing at any time. You can monitor the data remotely through the mymobility clinician dashboard before and after surgery to identify patients who may need extra attention along the way. 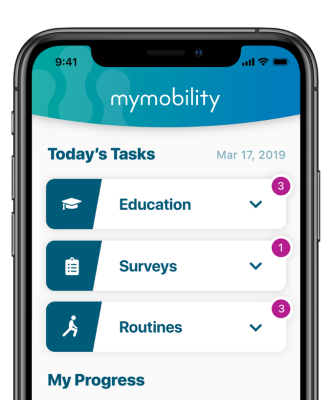 mymobility provides messaging that features the ability to send text, video or picture messages to patients in order to check on their progress and recovery, answer questions or help them stay on track without the challenge of scheduling a phone call or appointment. By continuing to support patients outside of the surgical event, you are able to reduce the variability of care and increase overall patient satisfaction. mymobility with Apple Watch was created to change the patient experience for othopaedic procedures by providing an opportunity for two-way dialogue, resulting in more support and guidance for patients. It personalizes treatment protocols in an engaging way by delivering patient-friendly procedural education, answers to commonly asked questions and exercises based on an individual treatment protocol. This allows patients to better understand their condition and take an active role in optimizing their surgical experience. The surgeon and care team connection is designed to facilitate patient engagement and support overall patient satisfaction through their entire episode of care. ** Clinical results and patient satisfaction data have not been collected/evaluated from patients using mymobility; clinical studies are underway.